Tolling is costly but so are current traffic delays for the freight industry. In 2015, traffic congestion across the country added a total of $63.4 billion to the operating costs of the U.S. trucking industry, according to a study by the American Trucking Research Institute. Sean McNally thinks those costs probably are higher now. "What does that mean to the trucking industry? That's fuel unnecessarily burned. It's wages and pay. It's maintenance to vehicles," said the spokesman for the American Trucking Associations. "That cost is ultimately borne by the supply chain — directly in higher freight rates, indirectly in the form of delayed shipments to ... your Amazons, your Targets. "And ultimately, that all goes on to the consumer." 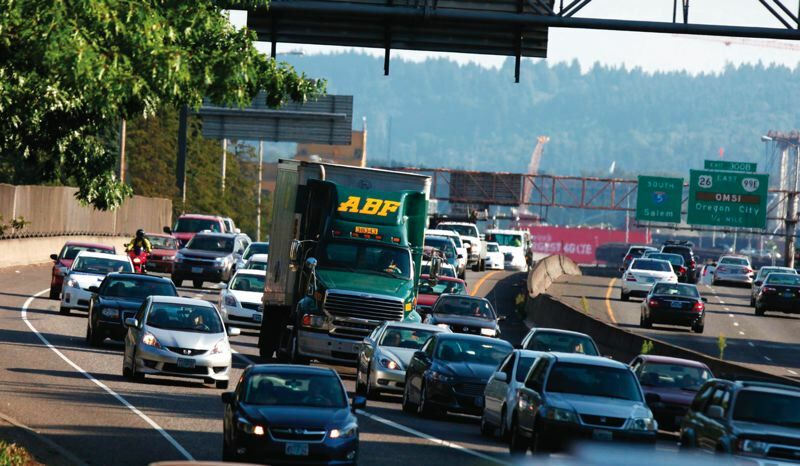 Freight haulers in the Portland metro area — and the businesses and consumers that rely on them — aren't immune to the costs of congestion. A 2017 report by Kirkland, Washington-based data company Inrix found Portland ranked 12th out of 240 U.S. cities for traffic congestion. Despite the costs of snarled traffic, freight companies and groups like McNally's tend to take a cautious stance when it comes to an approach being considered to ease congestion in the Portland metro area. Oregon legislators last year passed House Bill 2017, a $5.3 billion transportation package designed to provide money to improve bridges and roads, boost public transportation, and increase safety on roads. The money will come from a variety of sources, including increased vehicle registration and title fees, a tax on new bicycles, and a 0.01 percent payroll tax that went into effect July 1. The bill also set in place a 10-cent-per-gallon gas tax increase, to be phased in over time. The first increase — 4 cents per gallon — went into effect at the beginning of this year. Additional 2-cent increases will go into effect in 2020, 2022 and 2024. To ease traffic congestion, legislators also directed the Oregon Transportation Commission to seek approval from the Federal Highway Administration to begin tolling on Interstates 5 and 205 in the Portland metro area. The governor-appointed commission directed the Oregon Department of Transportation to call together a policy advisory committee to help shape a tolling strategy. Representing local governments in Washington and Oregon, business and transportation groups, environment advocacy and social justice groups, and highway users, the policy committee met six times. They held online open houses, which drew more than 13,000 participants, and in-person events that attracted nearly 450 attendees. They weighed the results of 2,586 questionnaires that asked respondents to weigh in on how they might use — or not use — tolling options in order to be able to travel more easily on local major roads. They held focus groups to ensure they were gathering information from segments of the population that might not otherwise be given a voice. At their last meeting earlier this month, they released recommendations for the proposal the transportation commission must submit to the Federal Highway Administration by December, a deadline set by state legislators. The advisory committee's recommendations call for further consideration of two pilot projects that would focus on an all-lane tolling approach. The first would place tolls on all lanes of I-5 through central Portland, between Northeast Going Street/Alberta Street and Southwest Multnomah Boulevard. The second would place a toll on all lanes on the Abernethy Bridge on I-205. The money collected would be used to help pay for part or all of a project to widen the bridge, according to the ODOT. The policy advisory committee also recommended the commission consider a third approach to toll all lanes of I-205 and I-5, contingent on an evaluation of how well the two pilot programs turn out. The recommendations also came with some calls for caution from members of the advisory committee. The pilot programs call for the use of value pricing — also called congestion pricing or variable-rate tolling — which uses fees such as tolls to manage the number of cars on the road at a given time. During times of the day when more cars are on the road, the fees charged would be higher. The higher fee is designed to lead some people to choose alternate options: traveling alternate routes, using public transportation or delaying trips until nonpeak times. With fewer cars on the road, the drivers who pay the fee would benefit from a faster commute. But data shows that tolling often hits low-income users the hardest. In the Portland metro area, increasing housing costs have pushed many low-income commuters farther from the city's core, into areas that have little or no bus or light-rail services. Non-English-speaking commuters also can be placed at a disadvantage, as can people without bank accounts, since automatic withdrawal of toll fees is the easiest form of payment. "There are serious fairness issues that the Policy Advisory Committee has forwarded to the transportation commission to look at," said Don Hamilton, ODOT Region 1 spokesman. "The way that this will affect low-income residents is at the top of the list of things that need to be looked at on the fairness question." Commissioners from Clackamas County have raised another issue — that of diversion. In an attempt to avoid congestion, drivers often bypass packed major roadways in favor of emptier rural routes or neighborhood streets. In Clackamas County, diversion is already causing problems that the commissioners worry could become even bigger if a tolling system is set in place without ways to limit or manage diverted traffic. "These diverted trips on to the county road system are impacting the livability of our communities and the safety of our residents and the traveling public, resulting in more crashes on the county system," the commissioners wrote in a letter sent to the Oregon Transportation Commission. Hamilton said the issues that have been raised are all on the radar of ODOT and the commission. Cities with established tolling systems offer examples of ways financial programs can be structured to help low-income residents cover the cost of tolls. The transportation commission and ODOT also are well-aware that expanding public transportation will be critical by offering commuting alternatives, Hamilton said. Right now, there's no plan in place for how agencies such as TriMet and CTran will coordinate with ODOT to make sure buses and light-rail services are expanded or adjusted in ways that don't create gaps. That is something the transportation commission will address in the future, Hamilton said. Metro-area businesses also will likely be asked to play a part in helping reduce congestion by changing shifts or adjusting employee schedules whenever possible. "That's one of the things that will help ease congestion on the roads — if companies stagger their shifts a little bit. If you've got people starting earlier, starting later, leaving later, then I think everything on the road will improve that way," Hamilton said. "That's one thing that I think other cities have seen around the country. ... The time of day for commuting becomes a lot more diffuse." Projects to ease congestion, such as the addition of auxiliary lanes and electronic signs on I-205, already have started. But the actual implementation of tolls is still years away. If Oregon receives federal approval to move forward with tolls, the state will still need to complete a long list of tasks, including conducting an environmental assessment, looking at how tolls would be collected, examining how the money from the tolls would be spent once projects are completed and paid for, and determining a system design. There also are points along the way at which the entire tolling plan could be abandoned if results aren't meeting expectations for decreasing congestion. There's also a petition drive underway that would require a statewide vote on whether toll revenue should be limited to infrastructure expansion projects without additional public approval. A study by the New York-based engineering and management firm WSP USA determined that charging vehicles $3.50 each to cross the Abernethy Bridge on I-205 would raise $50 million in a year, money that could then be used to pay for a new lane on the two-lane section of I-205. 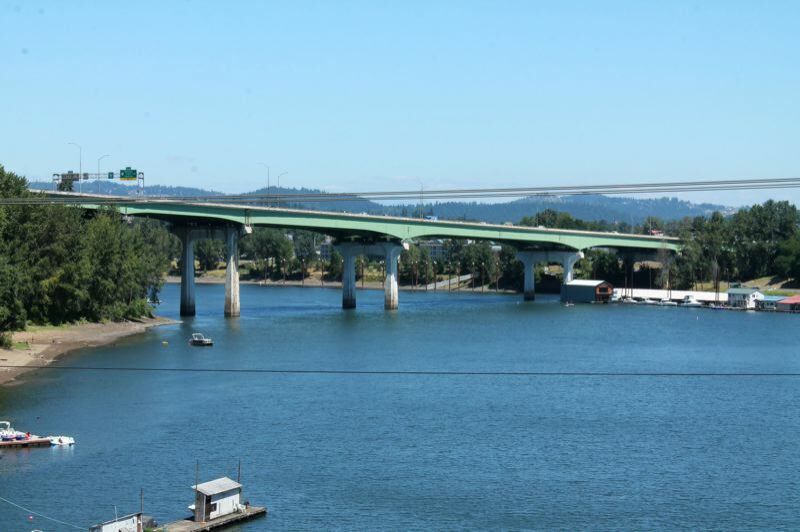 A policy advisory group has recommended the Abernethy Bridge and a section of Interstate 5 through downtown Portland be used as pilot project areas for developing a tolling strategy. However, Clackamas County commissioners aren't convinced tolls are the best way to pay for expanding the bridge. In a letter submitted to the Oregon Transportation Commission, the group ultimately responsible for determining the shape tolling will take, the commissioners urged the group to support finding the money now to pay for project design. 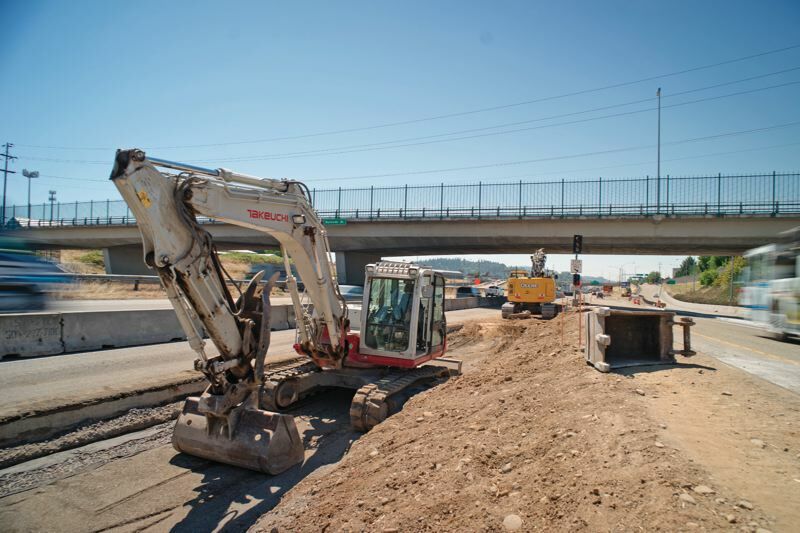 "Should tolling ultimately prove infeasible or not timely for funding for the I-205 project, Clackamas County would stress the need for the state Legislature to identify funding to move construction of the project forward," the commissioners wrote.